This is "Sending/Options" page in EurekaLog project's options. Warning: options on this page have no effect if no send method was selected. You should uncheck this option for non-GUI applications. 2. "Send in separate thread" (.sndSendInSeparatedThread) option will send report in a background worker thread. Exception thread will wait for this background thread to finish sending. Exception thread will update UI (process messages). Check this option to get smooth UI during sending. Uncheck this option is you are not using UI dialogs. • Not all send methods supports detection of bug report fixing. For example, any e-mail send method is unable to perform such checking. • Not all send methods supports custom "closed" messages. For example, HTTP upload is unable to do this unless you write a custom script which supplies a custom feedback. • If "Only "bug closed"-message" option is unchecked - then EurekaLog will show both types of "success" messages. • If "Show success message" option is unchecked - then "Only "bug closed"-message" option has no effect and EurekaLog will not show any "success" messages. 5. "Delete bug report after sending" (.sndDeleteFileAfterSend) option deletes local bug report file (you can set its saving here) after successful sending. 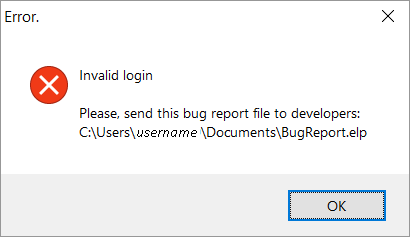 If user selected not to send report or if the report sending wasn't successful - bug report file will not be deleted. There is also a similar "Delete file at version change" option. Note: this option has no effect if you have disabled saving local bug report. 7. "Save bug report copy to My Documents folder" (.boSaveCompressedCopyInCaseOfError) option will save bug report file copy in "My Documents" folder if sending fail. Use this option to allow end user to send bug report manually to you if send fails (for some reason). Checked: copy bug report file to My Documents folder, if sending fails. Unchecked: do nothing on send failures. We recommend to check this option if you want your users to be able to send you reports manually when sending fails. Use this option if you expect sending to fail (e.g. no e-mail client installed, etc.). 8. 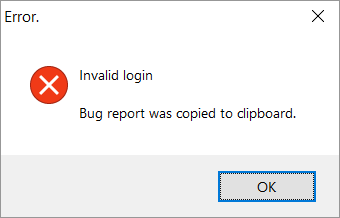 "Copy bug report to clipboard" (.boCopyLogInCaseOfError) option will copy bug report text into Windows clipboard if sending fail. Checked: copy bug report text and file to clipboard, if sending fails. User may use clipboard to (for example) paste report into e-mail application when sending report manually to you. • "Do not take screenshot" (ssNone) - do not capture/store/send screenshot at all. Use this for non-GUI applications or if you don't need screenshot. • "Capture active window only (may belong to other process)" (ssForegroundWindow) - capture window from GetForegroundWindow. • "Capture my application's active window only" (ssActiveWindow) - capture window from GetActiveWindow. Usually it's the best option for typical GUI application. • "Capture my application's windows only" (ssApplication) - capture part of desktop which is bounded to rectangle of all your (visible) windows. It's possible that other applications will be caught in this rectangle. It's recommended option if you have non-modal windows with important information. • "Capture primary monitor's workarea" (ssWorkarea) - capture primary monitor without task bar or any other desktop panels. Some sensitive information from other applications can be caught with this option. Use with care (your application may be classified as spyware). • "Capture primary monitor's screen" (ssPrimary) - capture the entire primary monitor's screen. Some sensitive information from other applications can be caught with this option. Use with care (your application may be classified as spyware). • "Capture the entire screen (full desktop)" (ssDesktop) - capture the entire Windows desktop (multiple monitors). This option works exactly as "Capture primary monitor's screen" on any single-monitor system. Some sensitive information from other applications can be caught with this option. Use with care (your application may be classified as spyware). Screenshot is sent as separate file in 256-color (8-bit) PNG format (if screenshot creation was enabled, of course). Maximum screenshot file size is typically less than 150 Kb for full screen. Typical file size is around 20 Kb (when saving one average window only). • Active control or active window are indicated by bounding red rectangle. • Screenshot will contain mouse cursor, if mouse cursor was positioned inside captured screen area. • Your application's windows may be covered by other applications. This is especially true for "Capture active window only (may belong to other process)" mode. • Screenshot may contain data from multiple monitors (capturing entire desktop or capturing window which is placed across few monitors). Any area outside of any monitors (if it exists) will be filled with black color. 10. 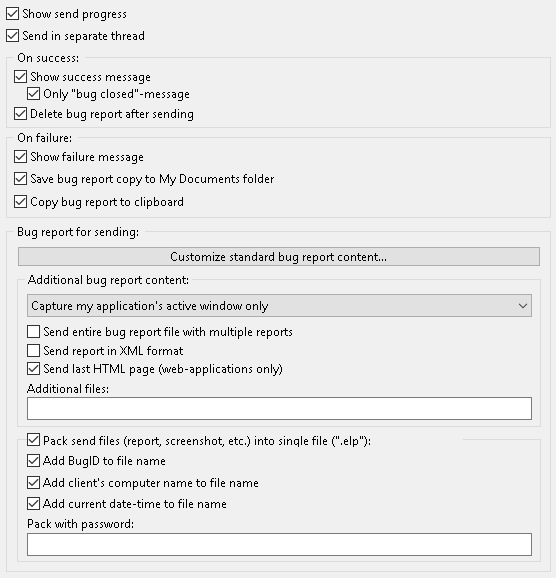 "Send entire bug report file with multiple reports" (.sndSendEntireLog) option specifies content of .el/.elx file. 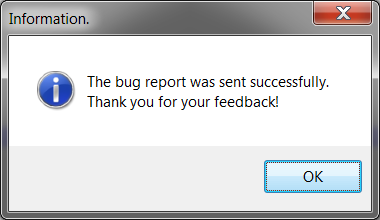 If this option is unchecked - then sent bug report file will contain only 1 bug report - the one from current problem. If this option is checked - then bug report file will contain exact copy of locally saved bug report file which may contain some old reports. This option has no effect, if you do not save bug report locally or if you limit it to 1 bug report. Note: it's best to enable "Delete bug report after sending" option, if you enabled this option. 11. "Send report in XML format" (.sndSendXMLLogCopy) option instructs EurekaLog to send .elx file instead of .el file. .el file is plain-text report. .elx is XML bug report. 12. "Send last HTML page" (.sndSendLastHTMLPage) option includes a last HTML page (if available). This option has effect only for web applications (ISAPI, (Win)CGI, IntraWeb, etc). 13. "Additional files" (.AttachedFiles) option specifies additional files to include into sent bug report. You can use ';' to separate files. You can use environment variables to access special folders. You can use relative file paths to access application's folder (useful for portable applications). For example: 'Configs\Master.ini;%APPDATA%\MySoftware\Config.ini' - this value will attach two files. One file is Master.ini file in Configs subfolder of exe's directory. Second file will be Config.ini file from roaming application folder. You can also specify this option at run-time. Or you can use OnZippedFilesRequest event handlers. Please note that this option will include files inside bug report when "Pack send files into single file" option is checked. To attach more files near bug report - use OnAttachedFilesRequest event. Note: current application directory have no effect on relative paths in this option. All relative paths are always resolved with application folder. 14. "Pack send files into single file" (.sndPack) option sends one single .elp file instead of bunch of files (.el/.elx, .png, .html and any additional files). This option is recommended for sending multiple files. You can turn it off for your convenience, if you send a single .el file (no screenshot, no XML, no additional files, etc). Note: some send methods doesn't support sending multiple files, so this option may be required. For this reason it's recommended to keep it checked, until you're sure about send files count. 15. "Add BugID to file name" (.sndAddBugIDInFileName) option alters default file name by appending a Bug ID value to it. Bug ID is a hash value of type and location of the problem. 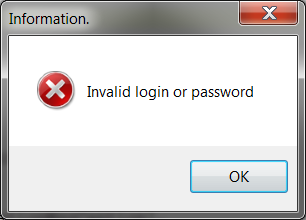 Exceptions with the same Bug ID is considered to be the same. Use this option to generate a more customized/unique bug report's file names. 16. "Add client's computer name to file name" (.sndAddComputerNameInFileName) option alters default file name by appending a name of client's machine value to it. All non-allowed file name characters will be replaced with safe replace character ('_'). 17. "Add current date-time to file name" (.sndAddDateInFileName) option alters default file name by appending a current date-time value to it ('yyyymmddhhnnss'). 18. "Pack with password" (.ZipPassword) option encrypts .elp file (which is actually a ZIP archive) with specified password. Use this option to protect .elp files during sending. You don't need this option if you use SSL/TLS. • This option doesn't guarantee full protection, since password is stored inside your executable file. Even if it's encrypted - it's still stored inside .exe, so it can be stolen. • It's not the same as bug report content's password.